Upon checking into our hotel room for a 2 week mission trip with OMS International, we were about to become acquainted with a stark reality: being in Russia was like stepping back into the 1940’s. Everything was old, worn or archaic. It was a bit of a stunner, as we realized that this nation everyone thought was right on par with the U.S., was, in fact, pretty far behind in many, many areas. The fact that most of us, as Americans, had no idea what it was really like in Russia, was apparent with the shock our team encountered. And really, there was no way FOR us to know, was there? Who had traveled to the U.S.S.R? What did we really know about the Soviet people, now broken up into many, many nations? What did these Russians know about us, as Americans? And what do they know today? Similarly, knowledge about Mexico, for most Americans, is limited to sporadic, and usually bad reports on the news. And for the Mexican people, it is equally limited, unless someone has had relatives come here and live in the U.S. Many of the Mexican people we encounter, ‘south of the border’, dream about a better life, more food on the table, better schooling, greater job opportunities, and the chance to just LIVE better. Some, to be sure, are shady, and are considering illegal options, such as drug running. But many of these people just want a better life for their children. So, they consider the United States. They dream about living here and what that would be like….what the opportunities might present, what prosperity living here might bring, etc, etc. In fact, some of them might think it would be ‘easy living’ here in the U.S. Just as we expected life in the former Soviet Union to be have much more of a resemblance to our country, many in Mexico have unrealistic expectations about life here, “in these United States”. It’s hard work, as prices are much higher in general. Gas is considerably more expensive here, and getting higher. If you are not a citizen, of course there is much more to consider, specifically, jail time and deportation if you are caught. And, if you are trying to become a LEGAL citizen, years of waiting, red tape, and money can make the attempt difficult at best. Are the rewards worth it? Over time, we have met those in Mexico who feel living here and the struggle for citizenship is worth it. We have also met those who come here and work seasonally, and then prefer to go back ‘home’. After all, home is where the heart is, right? But week to week, we mostly meet those who simply dream of what has become known as ‘the OTHER side’…. They dream of what they believe would be an easier life. 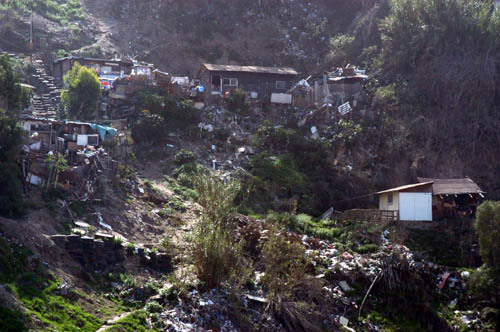 They dream of clean streets, clean buildings, public school for kids, plentiful jobs, an uncorrupted government (by Mexican standards), and a freedom unknown to many of the poor of Mexico. Do they make it here? Some do, but most just dream on. And so, we travel 20 minutes south of our city, delivering bread or vegetables, or eggs, or fruit to those who have less. We distribute to those on the streets, to those with small children, to those deported, to the Salvation Army, where sometimes they have run out of bread for those living within. We take things to those ‘on the other side’ of OUR border & try to bring the hope of Jesus to those who think living here will be the answer….. And we always want them to know that, no matter what SIDE of the border you live on, JESUS is the only one with the answers. He is the only One Who will make life better. Imagine living on this hillside . . . . . . looking across this wall . . . . . . at this view! I remember the first few times I kept hearing this from the locals we ministered to in TJ. “Are you from the other side?”, they would ask or, “I have family on the other side!” I realized at some point, this was more than just a slang reference – it was a life perspective for our friends who live south of the border. 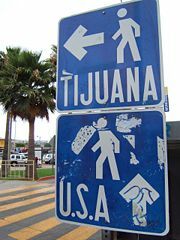 A perspective that I would have never imagined; Tijuana was Tijuana and I had certainly not dreamed of what it would be like to live there! Funny thing though, in efforts to be accepted as a familiar face I find my self answering now, when asked, “I am from the other side”.